When Daniel was little I first got the courage to do Sirsasana in the middle of the room. I did it triumphantly a few times, then I fell. I was too much in the head, and not enough in the pose. When I fell, I fell on some of Daniel's toys and hurt my back. It took a while to recover. That was back in 2012/2013. 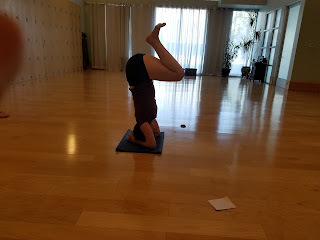 Now 4-5 years later, as a much different Yoga student and teacher I have again been able to do that pose in the middle of the room, and Daniel has taken pictures of me getting into the pose.